Yay, it’s back! The 12 Deals of Christmas from the last 4 years have been so popular that I couldn’t not bring it back to you again this year….! Oh this is just such a pretty card! I had fun experimenting with the Sweet Soiree Suite and decided to work with the paper from the suite. 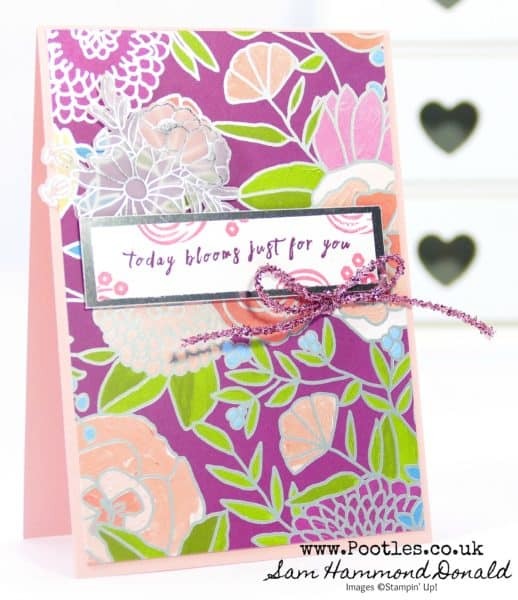 How stunning is the foiling around the flowers? Just divine! I pulled out the Embellishment Kit to add the vellum flowers on the top left. I don’t think my heat embossing on vellum would be quite so neat! 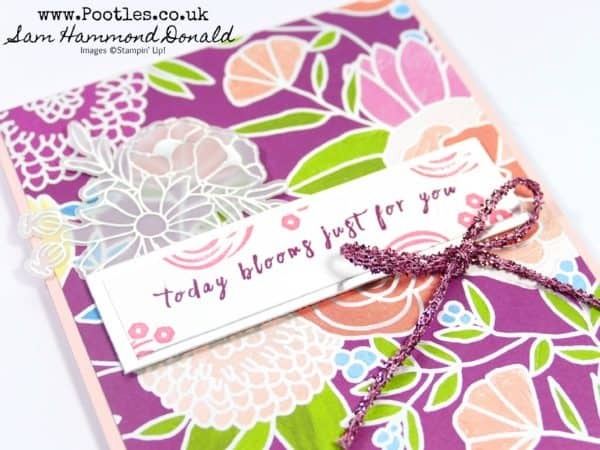 I had considered using the matching stamp set, but decided to use the greeting and flowers from Perennial Birthday instead. The font was just right for this project! Finished with a bow from the new duo pack of Tinsel Trim, I am more than happy with how this came out. Only a few more days to wait….! All orders over £50 will receive a pack of Gold Glitter Flakes from me, as well as their regular Thank You Gift Pack. It will come direct from me, as this is an offer direct from me. It will not come with the order you place. If you use the hostess code for the month, it will still count for Both! Sam: Sniff! Sniff! I never received the two blenders you mentioned you had sent to me. Sniff! Sniff! Hi Sam, I do so love this dsp and your card reinforces my belief that some absolutely gorgeous projects will be the result. Your card is so beautiful.